KARACHI - Two lawmakers of Pakistan Tehreek-e-Insaf (PTI) hailing from Karachi were embroiled in bitter altercation. The video is making rounds on the internet. 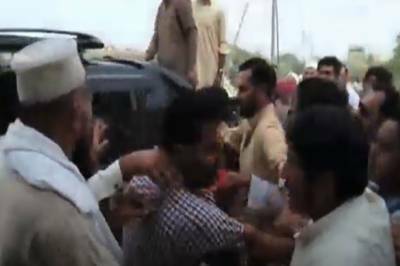 In the viral video, it can be clearly seen that PTI’s member of National Assembly Aftab Jahangir and member of Sindh Assembly Rabistan could be seen embroiled in physical brawl. The scene got intense when supports of both lawmakers also jumped in to lend support to cause of their respective leaders. Both the parties freely used kicks and punches in the fight.